The drive was pretty straight forward, less than two hours from East Hertfordshire so easily accessible. When we arrived the sun was shining but it was a little windy. 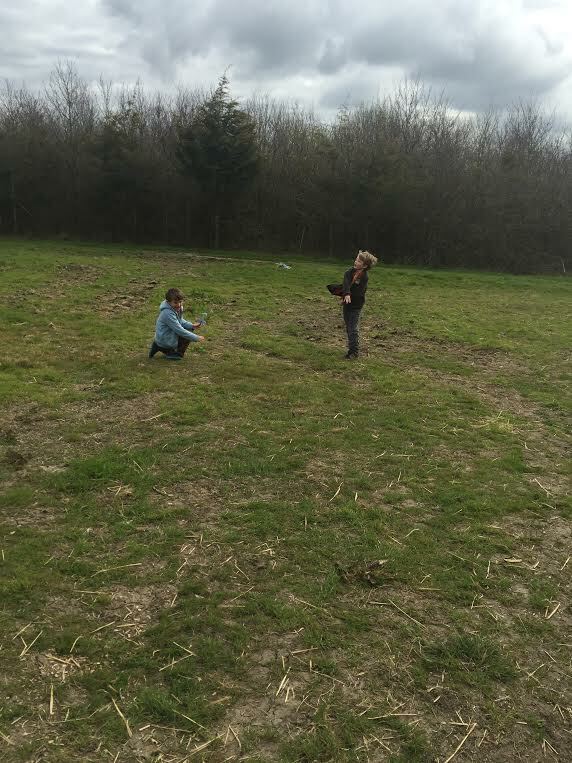 Laura, lady of the farm, mum to one, keeper of land and lots and lots of chickens, welcomed us. 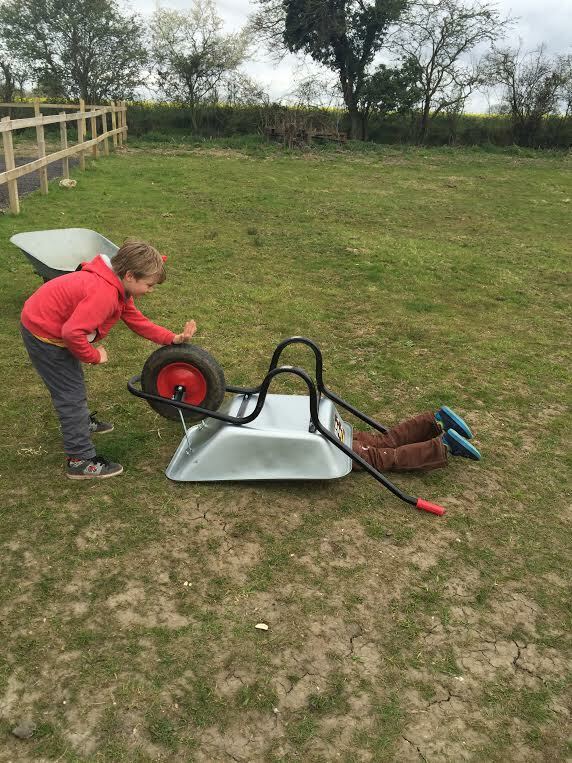 The tents are not accessible by car, they are situated around the edge of a field with lovely views and the best way to transport stuff is by wheelbarrow. Laura gave us ice packs for our fridges: in fact these are a tale in their own right- hot water bottles filled with water and frozen, pure genius and ours lasted all weekend (not sure if that is because it was ccccooooolllllddd or that they actually work really well). The tents are beautifully kitted out, with a corner sofa (which was very comfortable), double bedroom with double bed and white linen, duvet and throw, two further bedrooms with twin beds and bunk beds, all with the same quality linen and fluffy white towels. It’s all a little confusing as the furnishings are so lovely and in-keeping with staying in a house that you expect to be warm but we had to keep reminding ourselves that we were in a tent and it actually wasn’t warm, it was more like camping, so we needed a few more layers in bed, even with the duvet! Something that probably won’t be a problem during the warmer months but in April be prepared! The main area of each tent has an AGA, and this was an absolute god send! Our first night was really cold but by the second night we had worked out what we needed to do to keep the whole tent a little warmer. Don’t let the talk of ‘cold’ put you off as we would definitely go back. 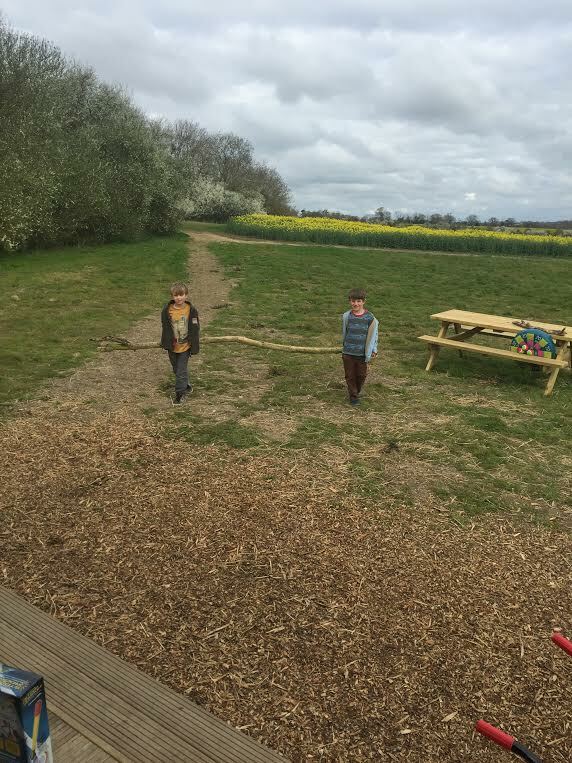 The field that the tents are located in is very safe for children to play, there is plenty of space for ball games and running free and the woods are ideal for foraging for kindle. The log store has an unlimited supply of logs that you can use for the AGA or fire pit or both! 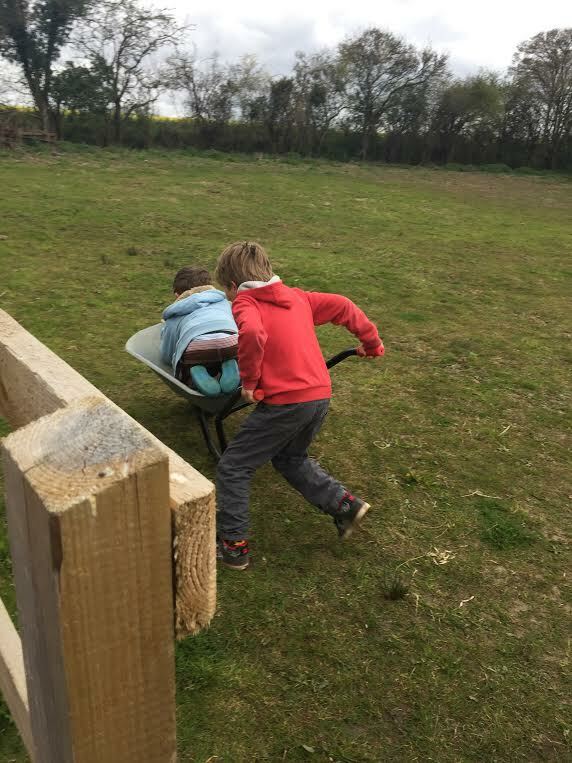 The kids enjoyed fetching our fire wood in the wheelbarrows, and each other! The honesty shop has basic items for your stay like kindling, matches etc. plus fabulous tasting eggs. Just remember to bring perishable items like milk, etc. or order a breakfast box. Our box had everything needed for our first morning. It was packed with local produce; eggs, bacon, sausages, bread, juice and marmalade plus cereal, milk, butter, tea bags and sugar. On our first night we lit the AGA and then headed off to visit the local pub, about 15 minutes’ walk, this pub has to be one of the best pubs we have ever had the pleasure of drinking in, full description here, but it is a must for anyone visiting the area even if you are not staying at Lantern and Larks, Sweffling Hall. 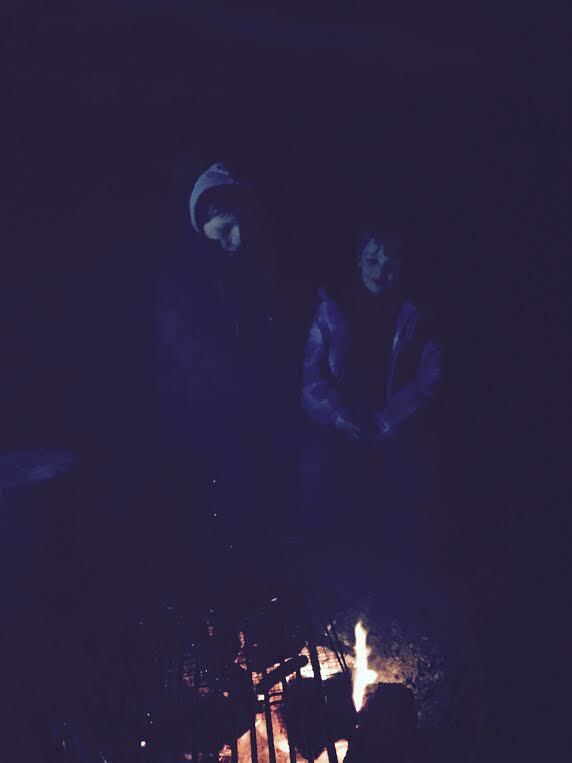 We headed back to the tent at dusk, re-lit the AGA and lit the fire-pit. 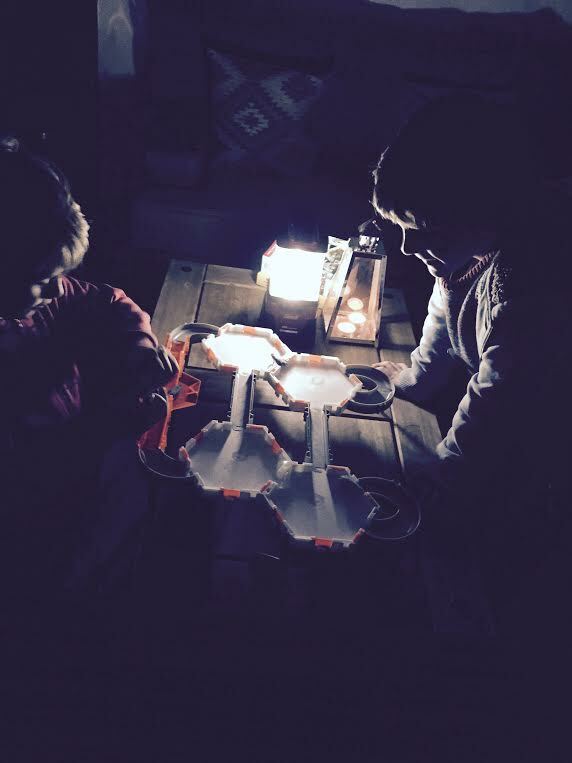 The kids played in the tent with their Hex Bugs until we were ready to sit round the fire cooking sausages – I think if it had been warmer they would have played in the field for a lot longer. We all slept like babies even though we had more layers of clothing on than usual. As dawn approached I was woken by bird song, it was actually so relaxing and beautiful, the bedroom was filled with song, a little like playing a bird song CD, not that I have ever had one, but I imagine. My husband missed all that as he slept with ear plugs and eye mask! 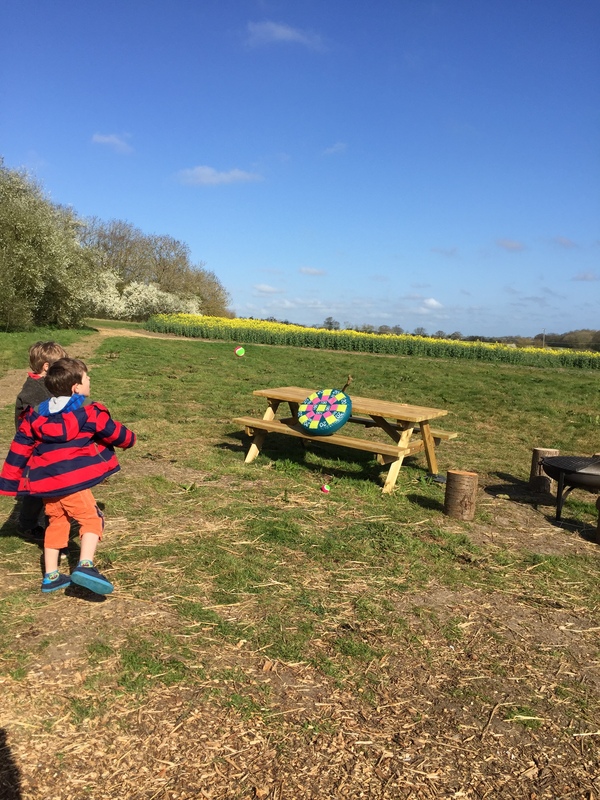 The ingredients in our breakfast basket were divine, the kids wolfed down bangers, bacon, local bread, beans and eggs and then headed off to play… If you are staying in the area you should visit Sweffling Hall Farm as Laura’s eggs are sooo tasty and ridiculously cheap! 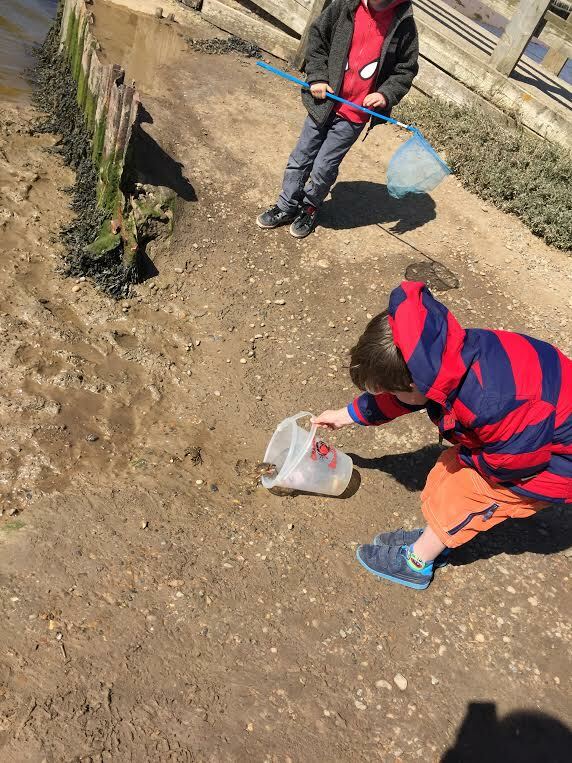 We spent the day visiting the coast, you can read about our family trip to Suffolk here. Back at camp the boys made the most of the space and didn’t stop until bed time. At first light after fueling their bellies they were up and out playing a variety of games. Even the trip back to the car on departure was fun! 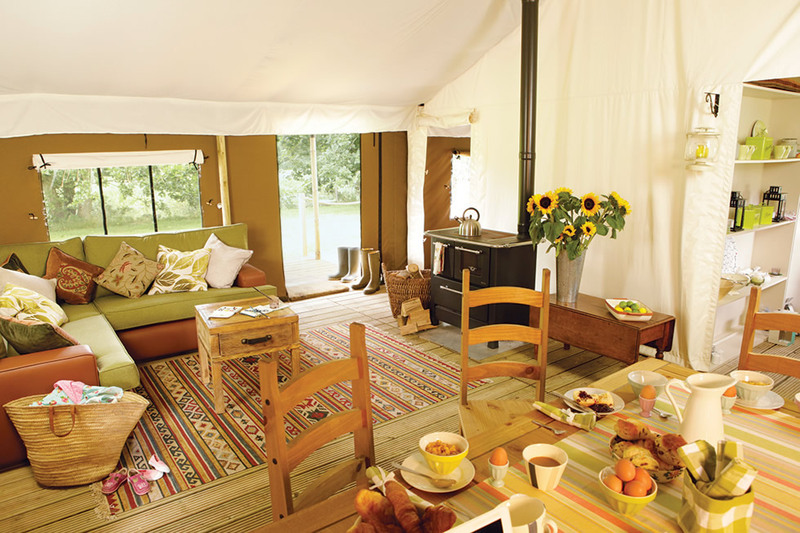 All in all these luxury tents are exactly what they are trying to be and offer a fab place to stay in the heart of the countryside in Suffolk. Should you want to go further afield they are perfectly located for beaches and attractions. 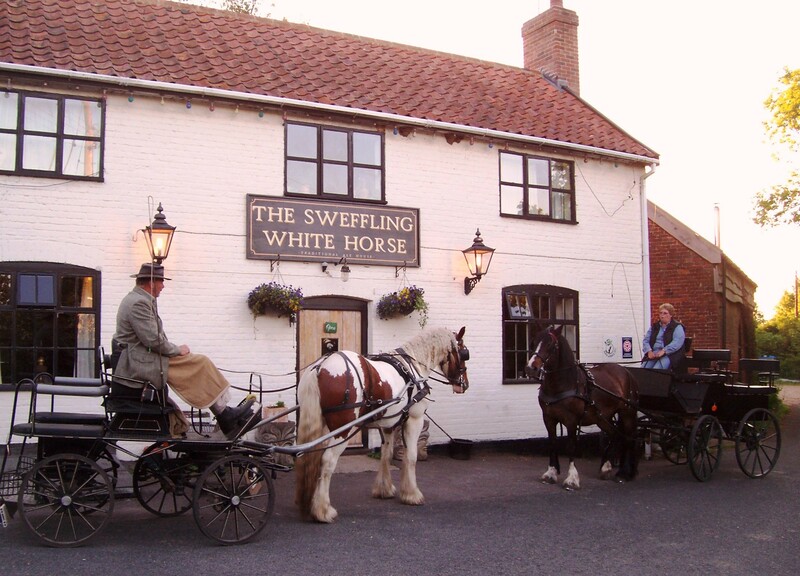 Here we stumbled across The Sweffling White Horse. 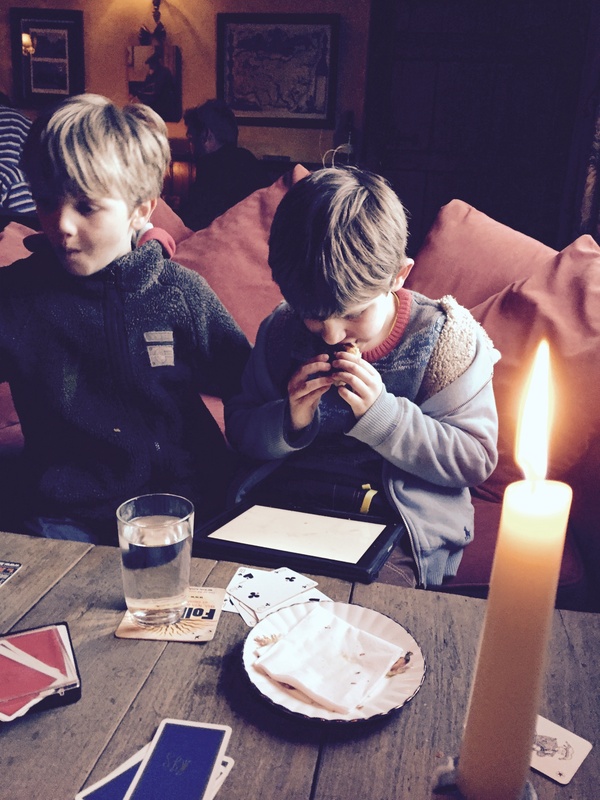 A quirky traditional English pub that will take you back through time. The ales and lagers are absolutely lip smacking scrumptious. Hubby had a draft local ale, I am not keen on beer but I tried one of their bottled lagers and it was quite possibly the best tasting lager I have ever had. The boys tucked into home cooked sausage rolls. This pub is full of character and so are its owners Marie and Mark. Their philosophy is to showcase local fare and treat you to flavour and quality. And they certainly achieve that. We headed back to camp and our lovely host at Sweffling Hall, Laura, introduced us to two cool apps: Skyview and Geocaching. Skyview is a great app for star gazing- I’m not sure how accurate it is but the kids absolutely love it! I had never heard of Geocaching but am looking forward to going on some real treasure hunts and will let you know how it goes. For now we just enjoyed the sausages, fire and stars. BTW if you are in the area and like eggs Sweffling Hall farm https://swefflinghallfarm.wordpress.com/ specialise in them and you can just nip in and purchase as many as you want. 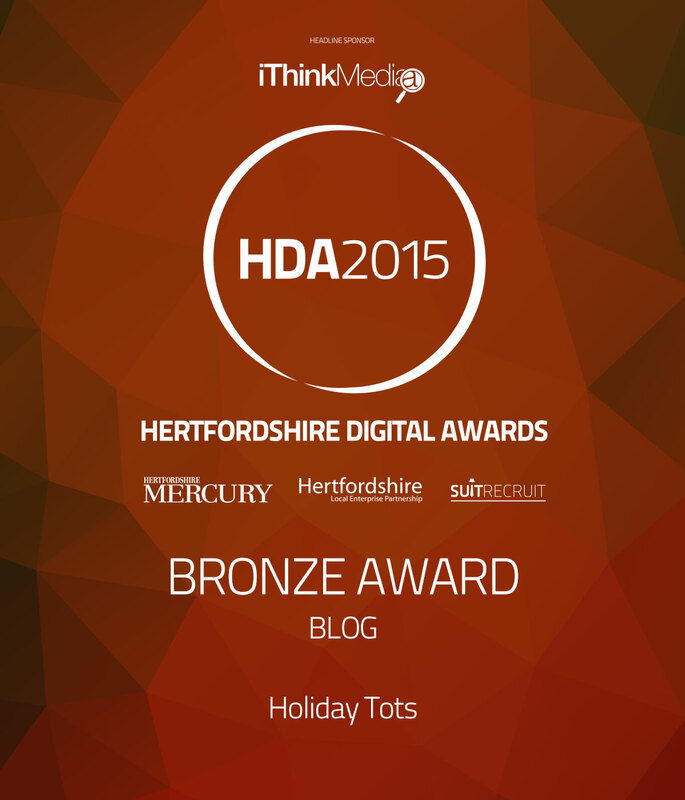 They are very very tasty, so good, in fact, they can be found in M & S, Sainsbury or at the Happy Egg Company. 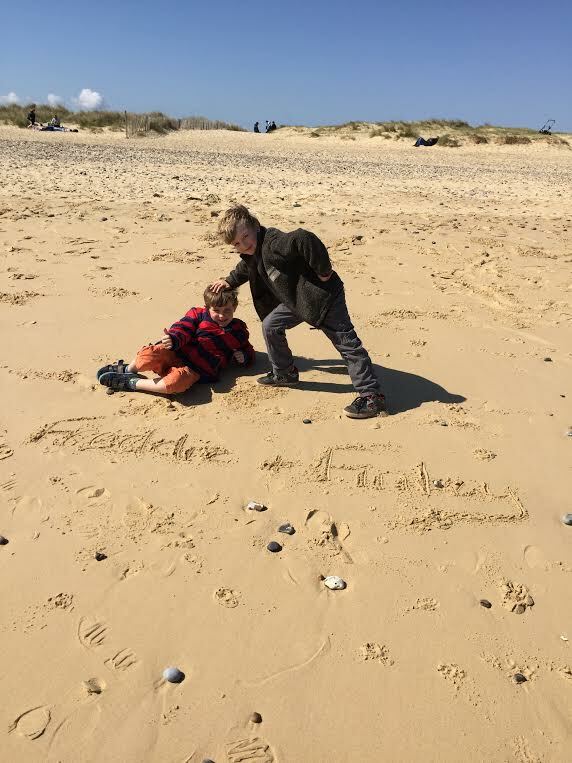 The next morning, after a little play in the fields of Sweffling Hall Farm and foraging for kindle for the evening, we headed off to the Suffolk coast. 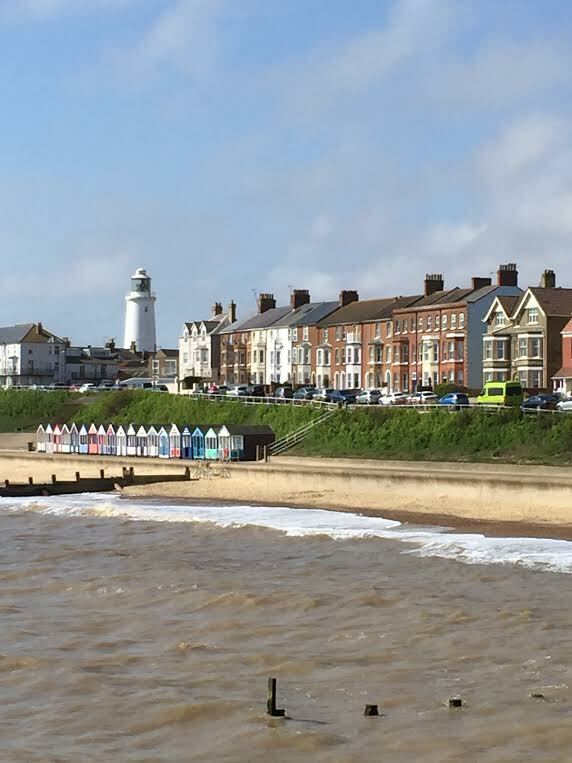 Our first stop was Southwold: what a lovely seaside town where once again we were whisked back in time- it feels like a place where time has stood still. We sat here, out of the wind, soaking the sun and taking in the view of the fabulous lighthouse. We then ventured to the weird and wacky handmade arcade also located on the Pier. The boys and I settled down into what looked like a submarine pod to watch a show. I really had no Idea what was going to happen but a lady and her two boys came out laughing a lot, so we ventured in. 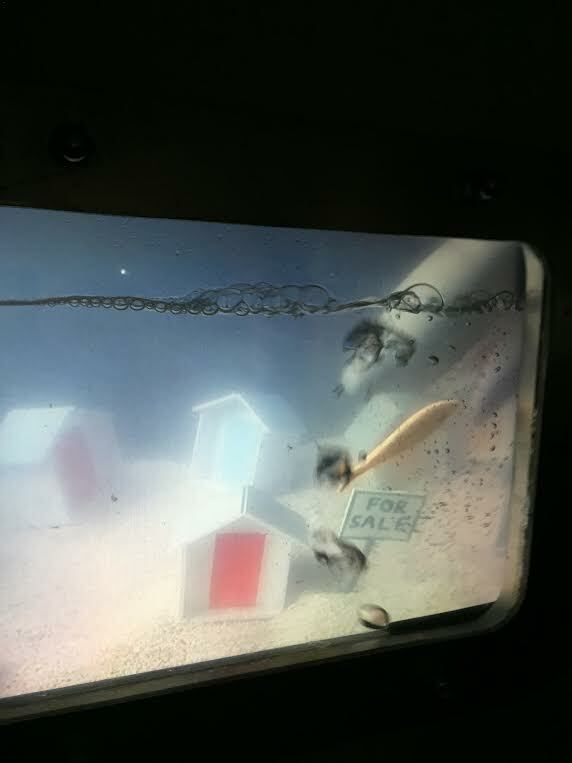 We were taken into a world under the sea where beach huts and for sale signs live, alongside estate agents sharks and barrels of toxic waste mate (yes mate) to make a monstrous sea creature… yes it was very weird! Thankfully the boys didn’t understand any of it and just laughed at the puppetry! There are some really wacky games to play here and worth a visit for a little strange fun. 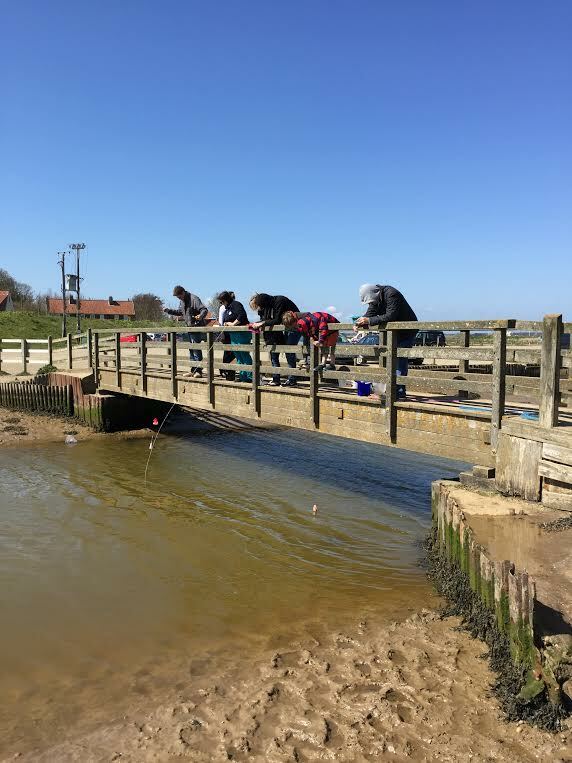 We then headed off to Walberswick. 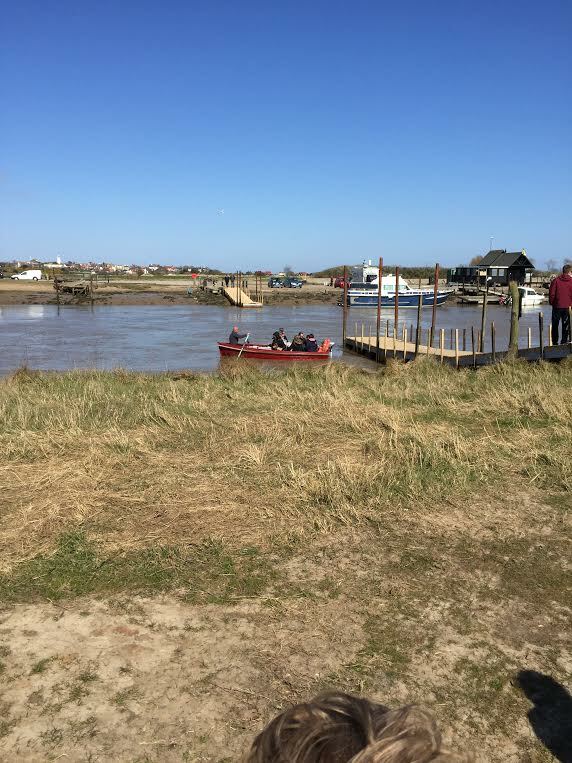 You can access this by small ferry directly from Southwold or by driving inland and coming back out again. 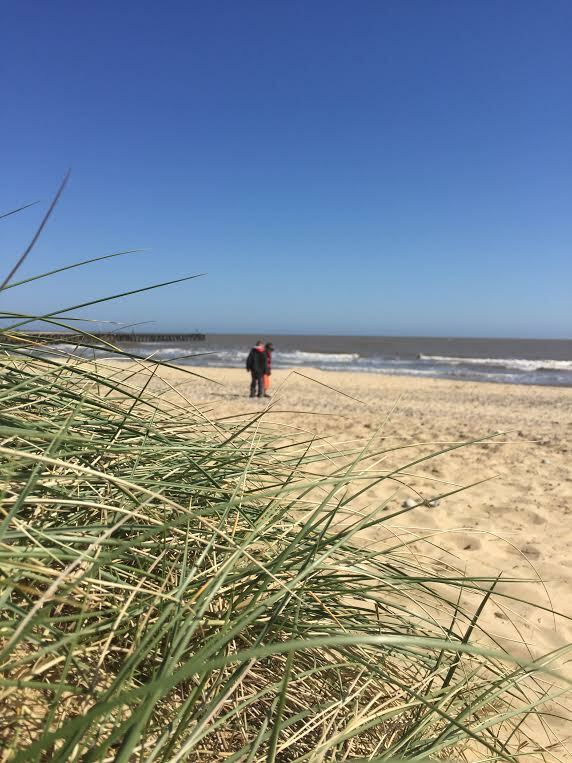 Walberswick is located on the South bank of the River Blyth surrounded by marshland, heath and a beautiful white sandy beach in an Area of Outstanding Natural Beauty- it’s no wonder that people want to own holiday homes here. After letting them go we headed for the beach, a little too windy today to stay but beautiful none the less. 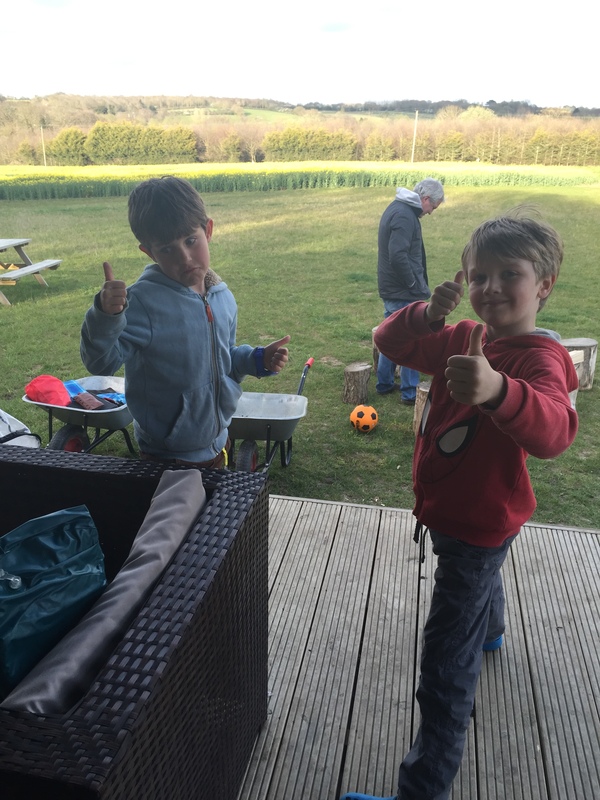 We managed to find a sheltered spot while the boys played. 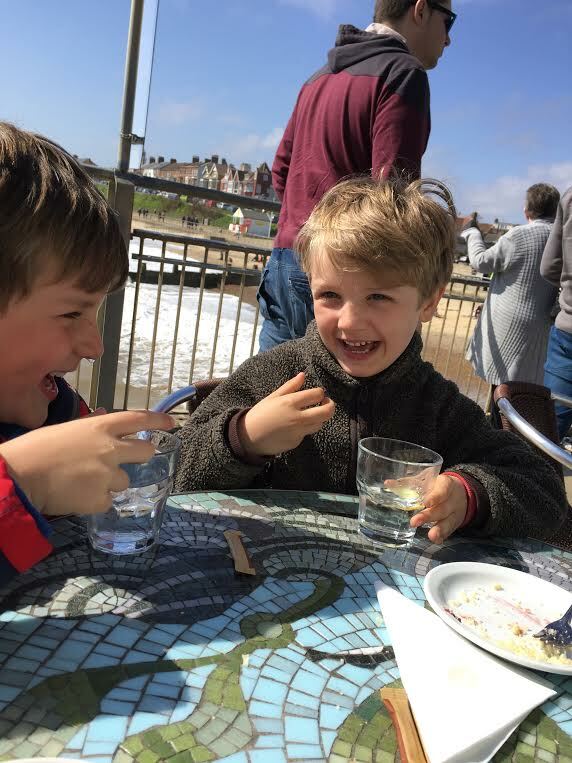 We then grabbed the all-important ice cream and went for a walk along the river. 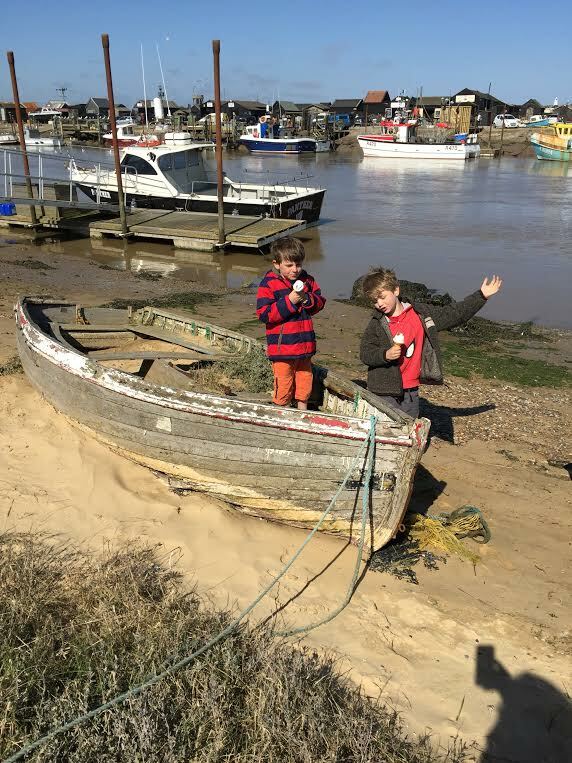 This is when we spotted the ferry that transports people across the water to Southwold (we drove). This ferry is actually one man in a row boat, quite surreal! 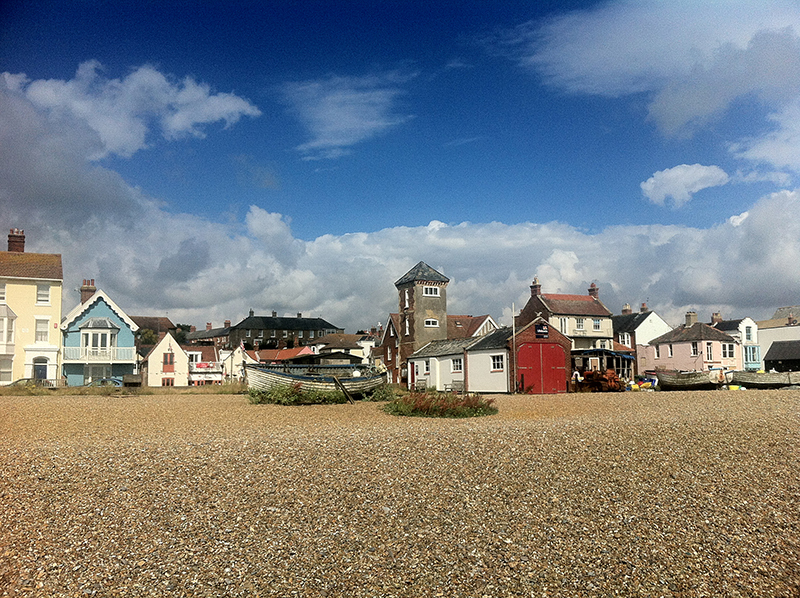 With rumbling beginning in our bellies we headed off to Aldeburgh. 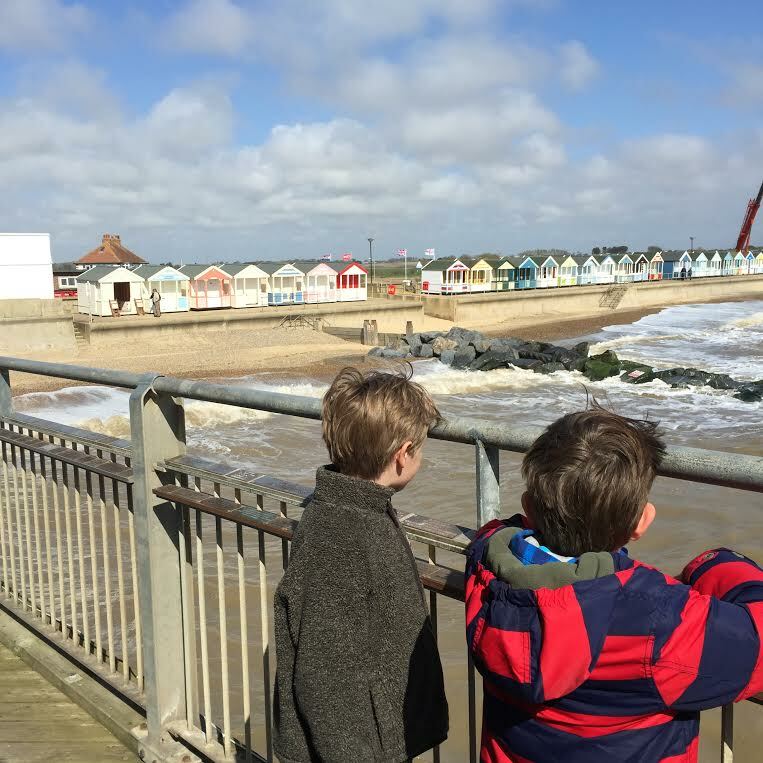 We actually were only visiting here for the highly regarded Fish and Chip shop (more about that in a minute) but the beautiful buildings against the pebbled beach took my breath away. 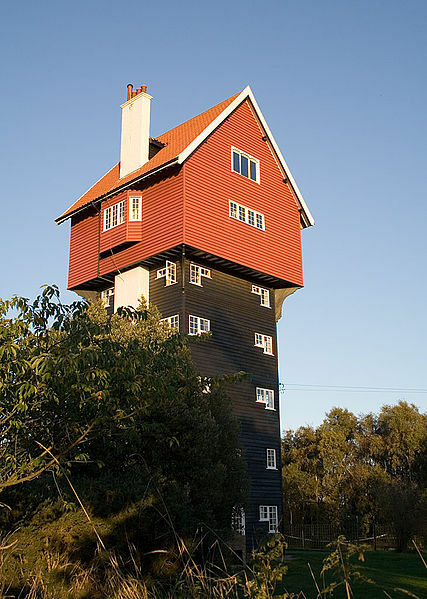 Aldeburgh has been named as one of the top 50 places to live in Britain and it is easy to see why, it is full of colour from the pastel coloured sea fronted buildings to the pebbly beach and colourful fishing boats and huts. 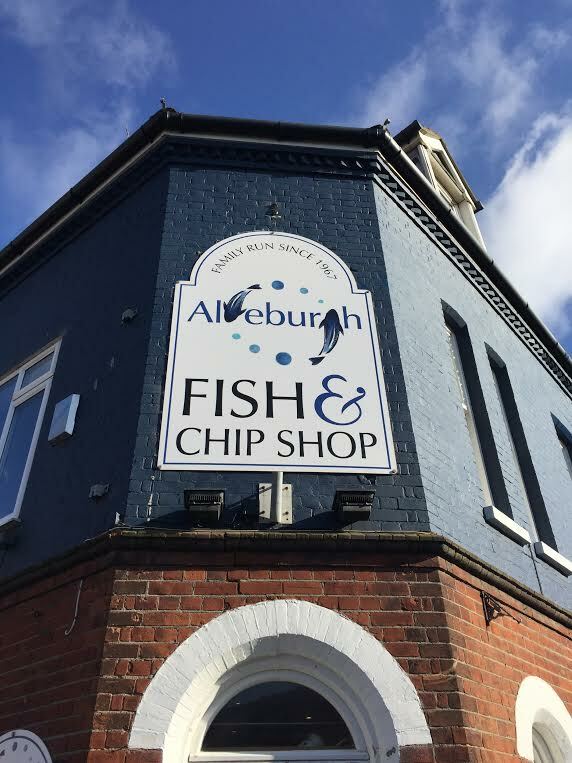 We found the famous Aldeburgh Fish and Chip Shop (reportedly one of the best fish and chip shops in the country) and devoured some of the best tasting fish and chips we have ever tasted. The boys ate every bit of theirs too! 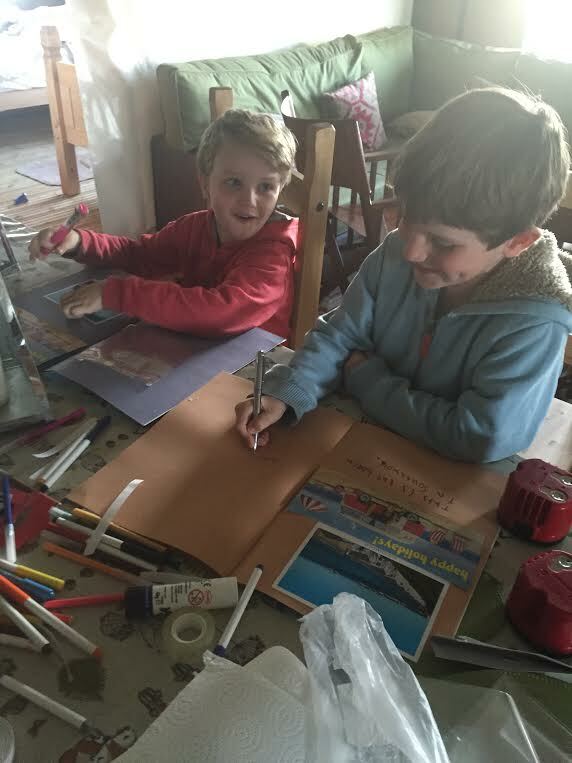 and making scrapbooks of our weekend using things we had found along the way from sand in the boys shoes to postcards purchased in each town. Some good memories had here. One got stuck on the tent. The boys went to find a stick for me to get it down, I said it had to be long, this was maybe a little too long!